This year Warwick had a number of students at the high school and middle school level earn Scholastic Awards recognition. Students submitted work in the poetry or short story, science fiction, or personal essay category. There are over 20+ different categories that work could be submitted for. Teens in grades 7-12 from the public, private or home schools can apply for categories in art and writing. Warwick students compete against others within the northeast region. The students have been working on these pieces since the beginning of the school year and continue until their work is submitted in December.Often times work for the Scholastic Awards is not in conjunction with a school assignment, but rather completed outside of school hours. “All the students who entered the Scholastic Writing Contest this year should be applauded for their creativity and courage to express themselves and to offer their work to a larger audience,” stated Mrs. Wendy Hoyer, Language Arts teacher at the Warwick Middle School. Warwick has a long proud history of success in the Scholastic Writing Contest. 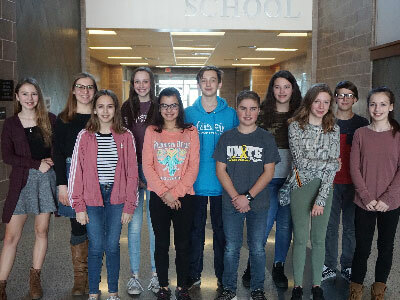 This year Warwick had 12 middle school and six high school students who were recognized for their exemplary work in the Scholastics’ Northeast Region at Large Competition. Students receiving Gold Key awards and will move on to the national competition results from that will be available March 13th. Gold Key recipients will automatically advance to national judging in New York City where renowned creative professionals will review entries from all across the country. Jurors select works for national recognition based on three criteria: originality, technical skill, and the emergence of a personal vision or voice.